Here we are... knee deep in the paperwork that is the adoption process! Brad has been amazingly organized and getting everything done in record time so far. We have had one visit with the social worker (who informed us that we are her most efficient clients ever) for our home study, the whole family has appointments to be poked and prodded and then deemed healthy enough to adopt, we have signed and read and signed and read form after form. We are waiting for passports and certified copies of forms saying that we are who we say we are...and a notary says so too! We are paying crazy attention to detail, while trying to keep all the forms straight and have the right ones notarized and sent off to the right person. All for the sake of growing our family through adoption...which makes this craziness, not only completely worth it, but kinda fun and super exciting. I have always thought about adoption, and in some capacity thought I would surely adopt one day, but it was always a way off in the future sort of a concept. Brad and I have talked about the idea of adoption since before we had our own kids, but then we had three boys and life got busy and there was always a reason not to. In the last two years we have been able to see the adoption process unfold for two families that we know. Their willingness to share their adoption process, the exciting, trying, frustrating, and the joyful aspects of it, made it seem very real and close and possible. Exhausting, but possible. I found myself unable to stop thinking about adoption and while I had always considered adoption to be a possibility, this was somehow very different. It is very much in my nature to take something like this and think to myself "yes, I feel lead to do that, but A LOT of people feel that way and A LOT of them probably have stronger feelings about it, or would be better at it." But as I talked to more and more people about adoption, I heard a few people say things like, "I just don't feel like that is right for my family, I could never do that." And I so appreciated their honesty, because it made me realize that I could never close that door. And maybe the reason that I couldn't stop thinking about it was because God was leading me toward this. So I talked to Brad about it. He agreed that this was something that God had laid on my heart and that, while he was a bit more hesitant, he was willing to talk about it and pray about for a few months. Oh and talk about it I did! I spent hours researching agencies and countries and then relaying all of my new information onto Brad. When we became pretty sure that this would eventually happen we talked about it with the boys to see how they felt about the idea and were happy to hear that they are all very excited. As we discussed more and more as a family, we became sure that adoption was what God planned for our family. We decided to wait until after we filled out our application to tell our family. But Spencer apparently didn't get that memo! (I love that he was too excited to keep it too himself!) He jumped the gun and told his leader at VBS that we were adopting, by the end of the day three families from that church found me to talk adoption because they had adopted already or were in the process of adopting too. After that we thought we better tell our family before they heard it second hand or from our kiddos. We applied with America World Adoptions. We are adopting from Ethiopia. We requested a sibling group of two with the oldest being 5. We didn't specify a gender preference. But I will say, our boys talk an awful lot about how fun it would be to have a little sister. So that's where we are, and how we ended up here. I am sure there will be many, many adoption posts in the future. After a fun-filled summer we are back to the school routine...almost. The big change this year is that Spencer started Kindergarten! Faithful blog readers,(who are probably quite disappointed in the lack of blogging lately) will know that Spencer has been a very busy and sometimes extremely challenging kiddo. I love him dearly, but he tested my motherly limits on many occasions. All of those moments lead to my frequently counting the days until he would be in school with his brothers and I would have a few hours a day to feel sane again. But when the first day of kindergarten rolled around I was suddenly very unsure what to make of the whole idea. Spencer was apprehensive, but was so brave. He just said good-bye gave me a hug and went on into class like a champ. I said good-bye, bit my lip and went crying to my car like a crazy mom. I was so shocked at how hard this transition was for me! I had, after all, been looking forward to this since Spencer's very terrible twos. How could I not be excited? I think that somewhere along the way all the counting the days until all of my kids were in school just became habit. I told myself that I was excited about it, but I never really thought about what it would be like. When Elliott and Wes went to school last fall Spence and I had a lot of time to spend together and I loved every minute of it. Turns out, that one-on-one Spencer is a purely delightful boy! He became my sidekick and source of constant entertainment and company. I don't think it ever dawned on me that alone time might be kinda lonely! Sending my boys to kindergarten has always been tough for me. They seem so small in that big school and I have to adjust to missing them for while each day. But when I look at how much Elliott and Wesley have grown and how much they enjoy school, I know it's the right choice for our family. 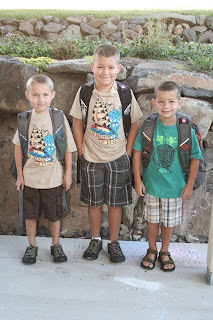 I am incredibly grateful for three boys who are very capable and who really enjoy school. Elliott is in 4th grade this year. He came home the first week of school and informed us that he wanted to join the strings group and play Viola. So that is something new and exciting for him this year. Wesley is in Second grade and having a great year so far. I think he likes being the older brother who can help Spencer along and share the wealth of knowledge he has acquired in his previous TWO years of school! I think this blog is being neglected. Yup, it's definitely being neglected. Maybe we will post something at some point again, but don't hold your breath. We got a few minutes to spend as a family one afternoon and we took the boys to the park to let them play with their newly acquired rolling toys (scooters and roller blades). Then we headed up to Keystone Jetty on Whidbey Island, but it was too rough with logs rolling in the surf, so we called it a day. Here is my attempt to catch up on several months of blog neglect. I decided to start going through my pictures and choosing the best ones from October. Maybe I will get around to November and December in the next couple weeks. We have more pictures of Spencer right now because he is always hanging around Lindsey and I. He plays with his brothers, but his attention span for them isn't very long. He would rather hang around with his parents and get into everything around them. Well, that was the longest hiatus I have ever taken from our blog. Three months! Yikes. No promises on what the future holds here, but our family is now back to cruising altitude and I can find a few minutes here and there to blog... or at least take pictures of our kids again. Toward the end of October it became apparent that our church would probably be given a new facility. We had a lot of meetings and discussion to figure out how the possible transition would play out. The biggest question was would we remodel before we moved into the new facility or would we wait until we were already in. Since there were good points to both sides of the issue, we came up with the idea of pulling off a remodel in 40 days and having our first service by Christmas. The remodel entailed tearing up and replacing the old floor and stage, tearing out a couple walls and rebuilding them, sheetrock, stone work, new stairs, new carpet, painting, completely rewiring the sound equipment, installing a new projector system... and a lot more. The contractors we talked to thought we were crazy. God must have thought otherwise... or maybe he thought of our "crazy" as faith. Anyway, somehow I ended up as one of the project managers for this remodel. I took off vacation for almost two weeks in November, and then didn't work more than 4 hours at my regular job until after Christmas. Most nights I was there until 10... many nights it was later than that. The real work of this job was done by more than 75 volunteers from our church who came to work long hours and do work that their bodies weren't made to do. There is no way this project could have been completed without the excitement and labor of the people in our church. It was amazing to see the man power our little church could put together and to see everything fall into place. We relied on a few contractors to come in when they said they could and they relied on us to get out part done. There were 100 things that could have gone wrong to throw a wrench into the timeline. Nothing did. The remodel was finished in time for Christmas morning and it was quite the event. Our church typically runs about 150 people per week, but on Christmas morning we had 350 people attend to show their support. The past two weeks we have run over 200. We hope that our enthusiasm for outreaching to the neighborhood will continue. I am proud of my wife who was basically a single mom throughout this process and she still had a huge roll in the remodel and outreach projects. We built the cross out of maple, and we found out that maple not a very easy wood to stain. It's so dense that it doesn't take the stain well. It's good that we have people who know what there doing, because it still turned out looking great! Also since maple is dense, it is very heavy. Now that we are back to normal life, hopefully I will get a chance to catch up on posting some pictures of the kids!